The All-New Nissan LEAF, the world’s best-selling electric vehicle, was named the “2018 World Green Car” at the 2018 New York International Auto Show. New York, USA (29 March, 2018) – The All-New Nissan LEAF, the world’s best-selling electric vehicle, was named the “2018 World Green Car” at the 2018 New York International Auto Show. LEAF is the icon of Nissan Intelligent Mobility, the company’s vision for changing how cars are powered, driven and integrated into society. “We’re very proud that since Nissan LEAF launched in 2010, we’ve been able to put more than 300,000 zero-emission electric vehicles on the road worldwide, helping to reduce carbon footprints around the globe,” said Daniele Schillaci,Executive Vice President, Global Marketing and Sales, Zero Emission Vehicle and Battery Business; Chairman of Management Committee for Japan/A&O; Nissan Motor Company. Best car we have ever owned. 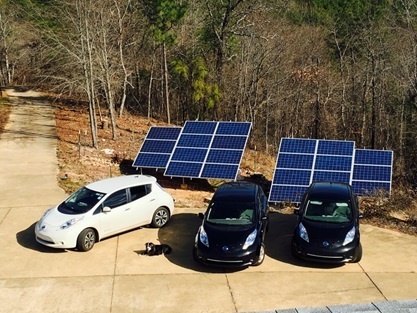 Our family of three saves around $5,000 USD a year now driving 3 Nissan Leafs. Alabama Power has a discount rate overnight so we can charge for free. We actually save money on our electric bill after charging 2 cars. My sons car is charged solely using solar panels. Healthier too since gas pump handles are the leading cause of communicable diseases. But EVs are not for everyone. If you drive out of town weekly or monthly in reas with few chargers or if you do not have a garage to mount a charger then your better off sticking with a plug in hybrid you can “opportunity” charge here and there. Also, the ranges that are publicized are kind of like gas mileage for gas cars. They assume you are driving 50mph. If you do a lot of fast driving your range will be less than advertised so allow some extra miles when selecting a car. Did I mention the LEAF is the most reliable car ever made? Daily drive less than 40 miles look at some great used bargains. Over 150 mile daily commute you need to find a new job or a new place to live mate. We can drive for free anywhere in Birmingham Alabama now for the rest of our lives. And the car seems like a ceiling fan it will last forever with no real moving parts. Congratulations Nissan. I guess Chevrolet was not considered for the Bolt since it is only sold in the States. I wish Tesla could get the kinks worked out. Great second family cars or city cars or young student cars.